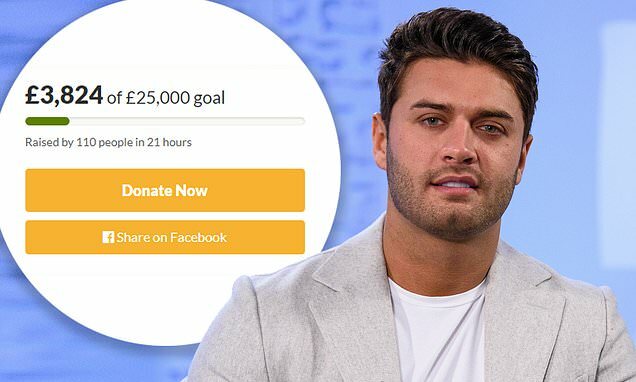 Mike Thalassitis' friends hope to raise £25,000 to cover the cost of his funeral so the Love Island star's family don't have to 'face anything alone'. The GoFundMe campaign was kickstarted by friends of Mike on Saturday and it has already raised more than £3,929 towards its goal. On the page, which currently has 115 supporters, an organiser revealed that the remainder of the funds will be donated to a charity of Mike's parent's choosing. The reality star, 26, was found dead near his Edmonton home on March 16, with both his manager and the Metropolitan Police confirming the news. Ellie, 22, has donated £250 to the cause after she made a heartbreaking tribute to her friend on Instagram a week ago. The model, who was a good friend of the late Love Island star, said his death will 'haunt her' for the rest of her life. Jack Fowler, who appeared in the villa last summer, also supported the campaign by sharing it on his Instagram story with the caption: 'Money will be put towards Mike's funeral & charity'. On the fundraiser page, Mike's friends described how his family had been doing 'everything possible to come to terms with the death' of his grandmother when the 26-year-old was tragically found dead. The message reads: 'Mike Thalassitis was a beloved son, brother, friend and good man to many people. 'Mike's family were doing everything possible to come to terms with the death of Andy’s mum (Mike's Nan) before their youngest son was taken within days of each other.